Using your Robot, you must challenge the others in a fight to the very last Gear: the most important parts you need to keep your Robot working! Once you get your precious gears, can you protect them until you can install them in your Internal Circuits? Or will some other Robot steal them from you? As you know, a good Robot is a Robot with all its Gears in the right place! 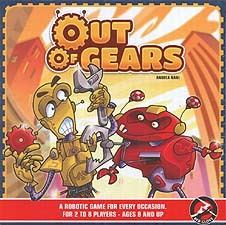 Out of Gears is a fast and fun game where you need a bunch of strategy and a lot of bluff!